Another blast from the classic arcades! . 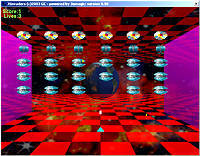 If you were good with space games at the arcades in the 80's, try this 3D version of the classic "Invaders" at your home. Blattle aliens on a 3D world, and take the challenge of the new "back and forward" movements to reach extra layers of Aliens per difficulty level. You control a little 'spaceship' object around the screen with the cursor keys, SPACE key to fire. Make sure you have a fast 3D capable PC, with 800x600 desktop display and the latest DirectX and video drivers. Press here to play it in your browser now!. It's only a 230k download if you already have the Jamagic browser control. The plug-in will automatically start downloading if it not found. Please wait for the full download (about 2 mb) if this is the first time you play a Jamagic game on the net. NOTE: the source code and project are for educational use, as a tool to learn Jamagic and is free to use as long as you run it from the Jamagic environment and dont compile and / or use it for commercial purposes. Space background graphic are a copyright 2003 of Innavoig Software.